Andy Blackwell and I have tested the latest batch of L-1 and L-2 Rapiers. Our very own 'Nighthawk' in his secret mission to the Czech Republic saw Dr Zigmund and brought back a batch of L-1s labelled '70mN' and batches of three types of L-2 labelled, "120, 140 mN and 'unspecified'". Above: two of the '120' motors look very usable; the third will give a very exciting flight indeed. The '140' motors are even more powerful showed a peak which was off scale. The 'unspecified' motors gave a similar performance and should probably be labelled 'HP'. These result were a little disappointing, but as these are static tests on my test rig we thought it best to try them out in models on the flying field so an accurate assesment of their performance 'in the real word' could be made. The L-1 overpowered my Lansen profile model (below) and sent it to the stratospere. Great and not unexpected, but trimming the Lansen for the extra thrust was a little nerve-racking! 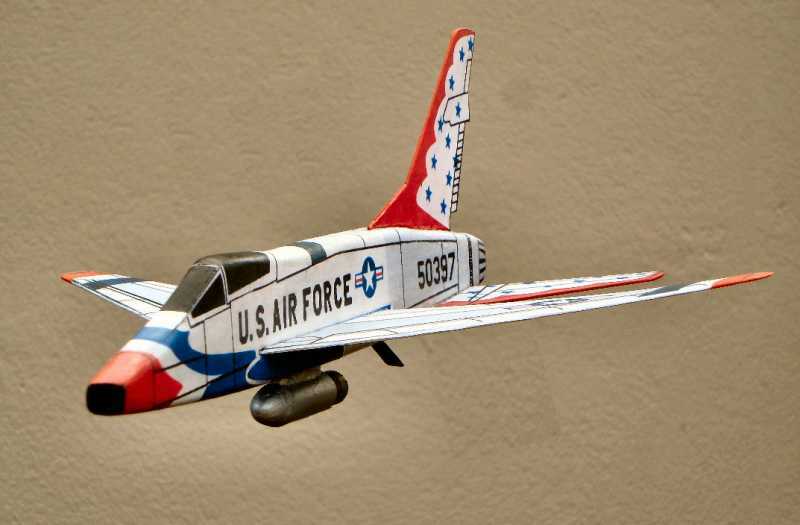 My Super Sabre for L-1 is a little larger and heavier, but it also needed a some readjustments to the rudder and ailerons ( a dead straight glide is the one to aim for) before it gave a lflight which, compared with last years' L-1s, showed the pilot had engaged the reheat! Conclusion: these motors ignited easily and can be used with care, but will work best in an 'L-2' size model. Also, I suppose, in an L-1 duration model! 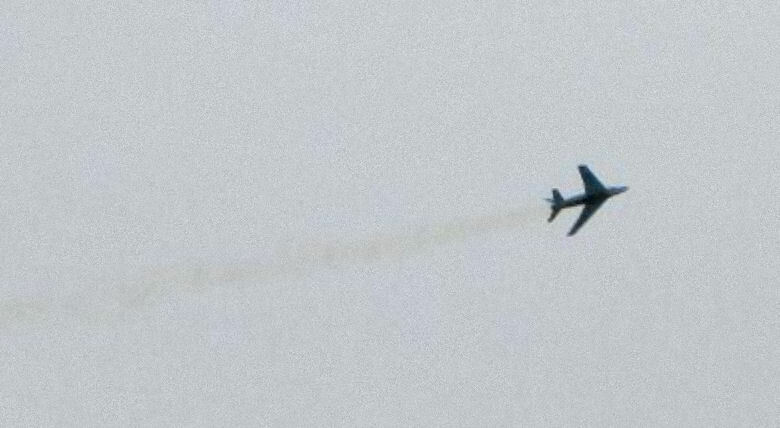 The '120' L-2s have much more thrust than last years 'standard' L-2s. This is not a problem if you are prepared for the extra 'oomph' and reset the conrol surfaces or cg accordingly. The will definately overpower a small profile model like the T-38 if the trim tab is not turned down. Above: my semi profile Skyay is quite large and heavy (40g with motor) and was designed for an L-2 HP. 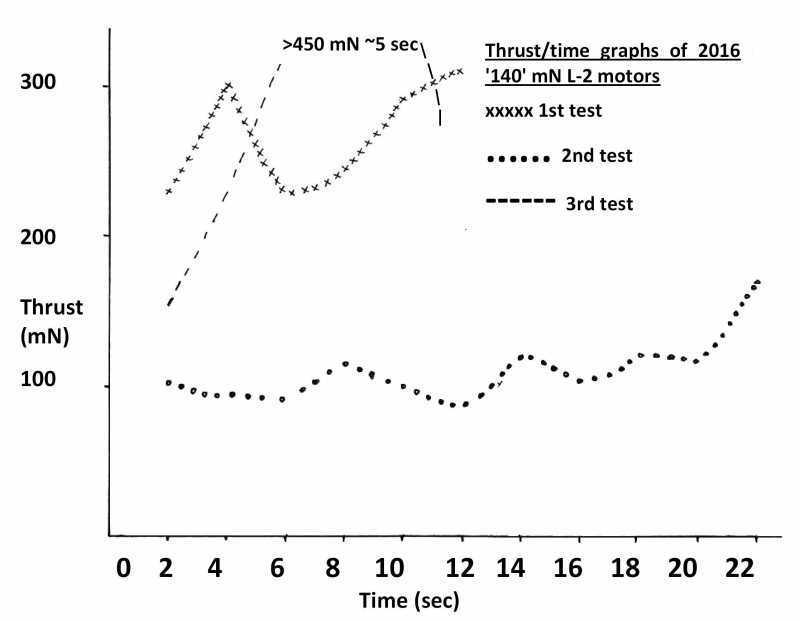 As the graphs indicate, the thrust built up during the flight, giving a smooth climb out followed by a fast climbing turn to height until cut off. This was OK and better than the model did with an old HP, but duration was still a little disappointing. I think they will suit a model like the old KK Swift very well. Above: Howard Metcalfe's Swift doing its stuff at Middle Wallop last year. This is a large model that needs a fair bit of grunt which the latest '140' motors will certainly provide. The 'unspecified' motors gave, as far as I could tell in the variable conditions, a similar performance. 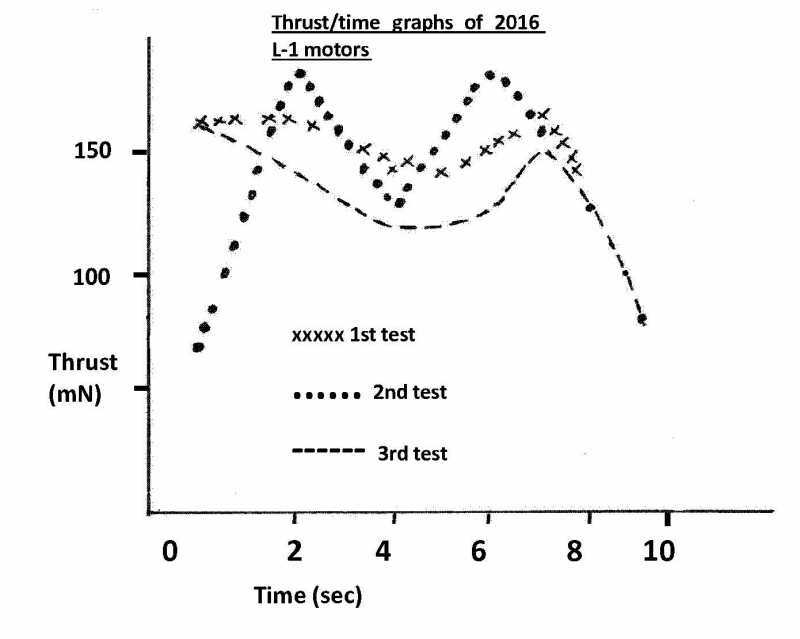 As the graphs simply, a couple of the eight test flights with the '120' and '140' motors were distinctly 'wimpish', giving a cruise at a little over head height, which was just asking to be shot down in the turbulent air we experienced at Mayfly. Conclusion: The latest L-2s ignited well and are usable with care. They are less predictable than last year's motors, but then, rocket flying is all about excitment and not for the faint-hearted. These motors will certainly give that, but the flyer will have to persist in retrimming to get a flight that doesn't end up smoking on the ground! We hope Dr Z will be visiting in July with some more motors and we can discuss our findings with him. The latest Rapier motors, both L-1s and L-2s are certainly usable and should give a spectacular performance in the right model. I will be at Old Warden later this month, so now is the time to stoclk up if you want to 'fly Jetex' this year! When we came home from Old Warden's July flying meeting, Howard Metcalfe and I tested examples of thetwo types of L-2 motors Dr Z had provided. We fired up two examples of his latest 'L-2 X's which Jan rated at '160 mN' for 16 sec' and duplicate 'L-2 LT' rated at '90 mN 22 sec'. 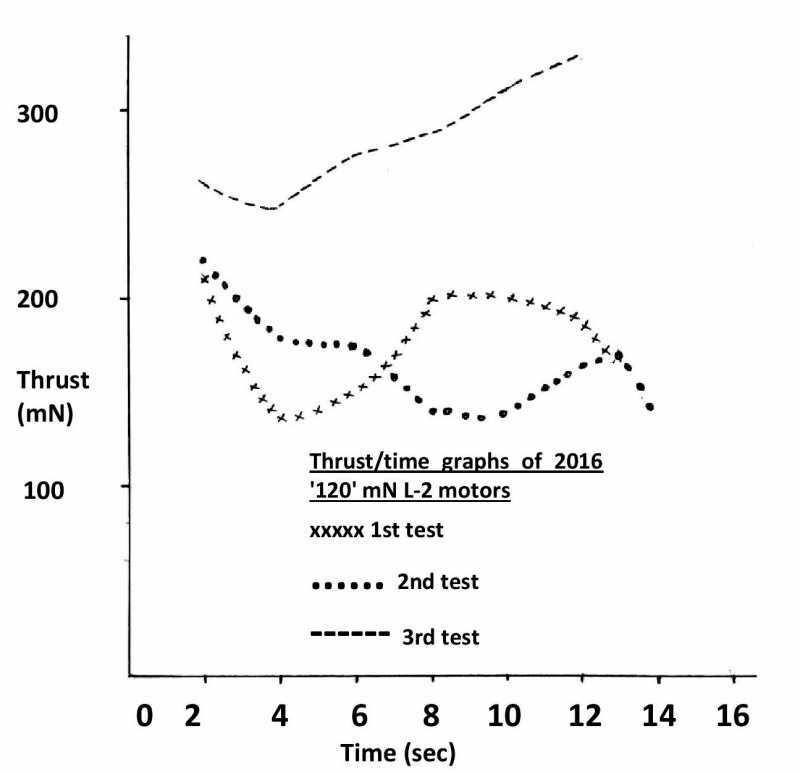 The results were: L-2X, 200-300 mN for about 13 sec; L-2LT, 140 mN (1/2 oz in old money) for about 16 sec. viz: Howard's BP delta was overpowered by the 'L-2 LT' and the 'L-2X' motors propelled Howered's large MiG 29 and my 35g Skyray (which need more than 200 mN to go well) very nicely indeed. The very good news is that the ' L-2 LT''s' will propel most 'Jetex 50 size models very nicely indeed and can be bought with confidence. The 'L-2X's' are great for the larger heavier models like the Swift, but I would hesitate to put them in a small profile model. I later tested the L-1 motors Dr Z had brought with him. These are less powerful than those Neil collected in the spring and very similar to the ones we had in 2015. Neil has examples of these left over, so now really is the time to stock up! I will contact you directly. Neil Sommerin has the remainder of the Stock Dr Zigmund brought over, and will give you his details. Neil will (hopefully) be at the September meeting so you can collect your order from him then.